No. 3 of a Series. In this, the third of a series of articles dealing with the problems of inventors, Mr. Miller points out some of the personalities who have found success through Specialization on certain ideas. One invention rarely makes a successful inventor, the money is made in amplifying the idea or applying it to new uses. You will find much of interest in Mr. Miller’s article. Next month he tells what not to invent. LAST month and the month before we talked about what to invent, how to invent it, and what to do with it after the device was perfected. But one invention, as a rule, doesn’t make a successful inventor. Even Henry Ford did not stop with inventing an automobile, but proceeded to invent a system of manufacture that has revolutionized all industry. Edison might have rested, financially independent, on either the electric light or the phonograph, but his list of patents range through motors, dynamos, portland cement, mining machinery, and telegraph instruments, to mention only a few. Few people know that the great Muscle Shoals nitrogen plant built during the war is equipped with Claude machinery. The Air Reduction company, which produces practically all the nitrogen, argon, oxygen, acetylene and helium used in signs, light globes, radio tubes and oxy-acetylene torches uses Claude processes and Claude machinery. The same plants produce two other rare gases, kryp- ton and zenon. There are 50 factories in their chain turning out gases extracted from the air, and 22 plants producing acetylene. 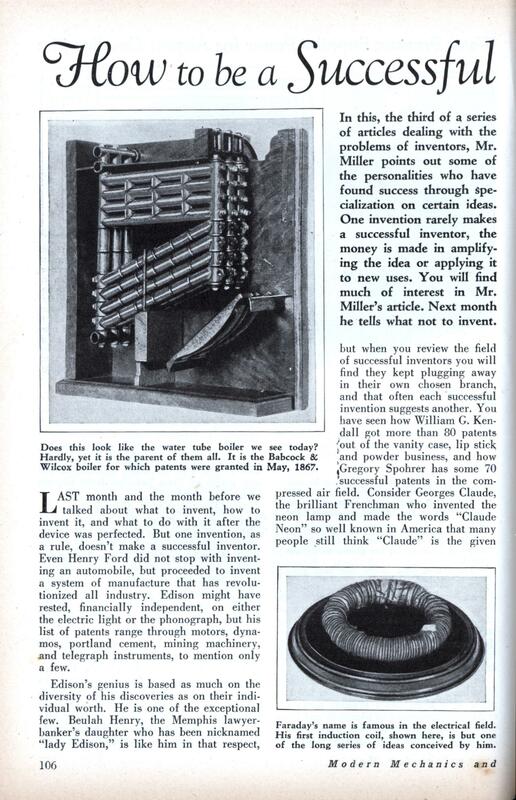 Dr. Claude started his inventions while hunting for a method of preparing carbide for the production of acetylene. That led to a study of means of extracting oxygen from air, and the result was liquefied air on. a commercial scale. But in breaking clown air he found it also possible to recover the rarer gases, argon, neon and helium particularly, which had been, up to that time, laboratory curiosities—for the production of helium from natural gas in Texas had not yet come into being. The problem of salvaging the recovered gases led Claude to decide on the creation of a new industry. Scientists knew that if they sealed neon in a tube containing mercury, and then shook the tube, the friction would generate electricity, causing the neon to glow, so Dr. Claude decided the natural use for neon was in lighting, and the neon sign tube was the result. He is working now on a plan for recovering the thermic energy of the sea. It appears fantastic, but most of the things accomplished in the last dozen years, would have been fantastic if foretold at the beginning of the century. Dr. Claude points out that surface sea water in the tropics has a temperature as high as 28 degrees, Centigrade, and 1000 meters below the surface the temperature is only 4 degrees. If the two could be brought together water could be boiled, in a partial vacuum, producing power equivalent to a 300-foot waterfall. This method would amount to using the energy of the sun for power, since the ocean temperature variations are produced by sunlight. William F. Mangels, king of Coney Island inventors, is an example of the successful inventor who stuck to one field. As a boy he helped his father build carousel parts in a small machine shop. In his spare time he invented the “razzle-dazzle,” a fixed center pole from which suspended seats were swung. As an amusement device it was about midway between the May pole and the modern airplane swing. Mangels en- listed a partner with $500—that was in 1890—built one “razzle-dazzle” and toured the county fairs. Three men were employed to pull the swings around with ropes. The device was a huge success, and the partners ended the season with enough money to build several steam driven ones the next year. In the next 25 years Mangels collected some 60 patents on amusement park devices. He brought out the “Tickler” in 1907, an inclined plane with cars sliding down and bouncing against short posts, which caused them to revolve. The first one built cost $6,000 and earned $42,000 the first year. In 1914 he brought out the “Whip,” the most successful of all his inventions. More than 500 were built and leased on a royalty basis, earning $350,000 profits in the next few years. Rights were sold in seven foreign countries. An exhibitor in South Africa ordered one which cost him, laid down in Africa, $14,000, but paid for itself in six weeks. Max Fleischer, artist-inventor, capitalized an unusual field, by improving on cartoon movies. A 1000-foot roll of film, which takes twelve minutes to run, contains 16,000 separate pictures, or “frames” and the animated cartoon consists of 4,000 pictures, each repeated on four successive frames. Until Fleischer came along 4,000 separate drawings were made. He conceived the idea of using cutout drawings with moving parts. To make a dog, whose body would not change, perhaps, through several feet of film, he drew a body, a head, ears and feet, on separate pieces, which could be moved and rearranged as needed. Two sets of ears, for example, were sufficient to produce the effect of a dog wagging his ears, by alternating the drawings. One pair is laid in place, a sheet of glass placed over the drawings to keep them flat, four frames of film in the camera suspended overhead are exposed, then the glass is lifted and another pair of ears substituted. To keep all the parts in their proper relation Fleischer conceived the idea of using paper with two holes punched in the same place in each sheet, the holes slipping over brass pegs on the drawing board. Miss Beulah Henry got her start as an inventor when she conceived the idea of the detachable umbrella cover—making possible a number of fancy colored covers to match various suits, all of them fitted at will to a single set of ribs and handle. Manufacturers were unanimous in saying it could not be done, and model makers declined to undertake the job. Finally, in desperation, she ripped a rib from an umbrella, used a stone for a workbench and a nail for a punch, and drove a hole through the end of the rib. From a cake of soap she moulded her idea of the snap fastener, took rib and soap to a model maker, and the trick was turned. A doll that changes the color of its hair and eyes at will, and a rubber bath sponge with the soap contained inside it are among her other successful inventions. “HOW to be a Successful INVENTOR”? Patent everything!